A Drag superstar, smart-mouth puppets, burlesque dance and Dante's "Inferno"? How the hell is this gonna work? In BenDeLaCreme's Inferno A-Go-Go, the classic text by the Italian poet gets reimagined in fabulous form for an evening of perfectly cheap hell jokes and a friendly reminder just exactly where hell is. 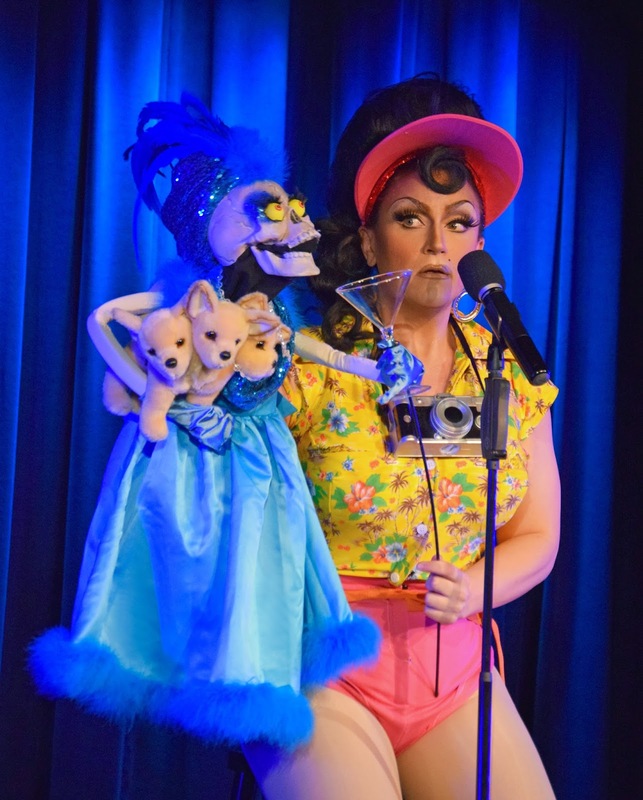 The RuPaul's Drag Race Miss Congeniality winner makes a triumphant return to the Laurie Beechman in a daring evening if dragtastic intellectual comedy. For those looking for a lip syncing queen, you're at the wrong show. What you're about to see is an elite entertainer who marries the world of theater with performance art. Inferno A-Go-Go is a funnily crafted riff on Dante's "Inferno" where DeLa takes her audience on a tour of every circle of hell. On her journey, she encounters sinners, homosexuals, and the Devil himself. BenDeLaCreme's script is humorous yet she smartly hits you with intellectual dramatics. She may claim she has only read the Cliff's Notes but it's evident much thought, time, and devotion was put in. And a little dramaturgical assistance from Scott Shoemaker. A sprinkle of political satire helps bring the tale into the modern age. With a moral of hell being ourselves, BenDeLaCreme brazenly engages the audience in a manner that's exciting and entertaining. The added element of video, from Shane Wahlund, original music by Major Scales, and sound, from Kevin Heard, elevated the solo show to new heights, or rings. Oh and Danial Helman’s costumes? Excellence. As a performer, BenDeLaCreme knows how to captivate. She is quick on her feet, even when a sound cue doesn't quite come in on time. We know her through her BenDeLaCreme character. The quirky voice and nostalgia aura inspires her persona. But this show we get to see a little more of a character showcase. The girl can play characters. From a Valley Girl messenger from above, to the absolute worst Bro ever, to the horrid personification of gay culture, DeLa captured them all. Luckily this show gets an extended stay. The more time she has to play, the tighter the show will get. BenDeLaCreme has a HELLuva lotta fun. If this is as entertaining as Dante's Inferno actually is, then sign me up! Let's all go to h-e-double hockey sticks in a hand basket!